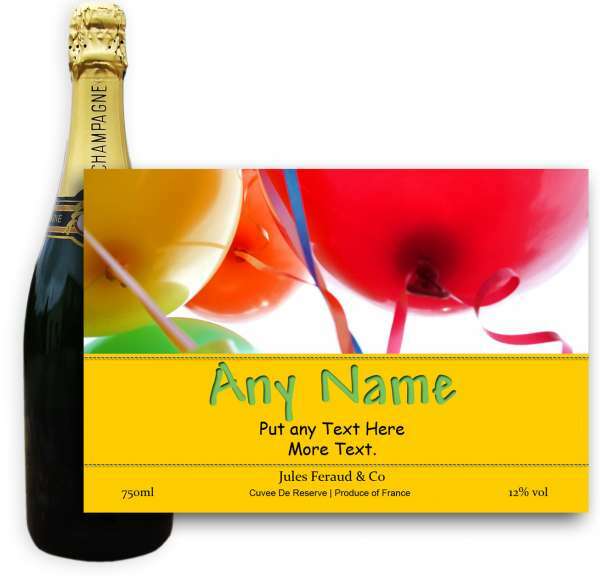 Jules Feraud Brut With Personalised Champagne Label Birthday Balloons A bottle of Champagne personalised as a gift that is a perfect for celebrating with style! Create your very own Personalised Bottle of Champagne with your own message on the bottle which is printed in full colour. Jules Feraud is a rich Champagne with savoury aromas. This deep golden Champagne is powerful but elegant; strong bodied and dry yet still balanced. A fresh fun and lively champange for any occassion...and deliciously easy to drink! Complete your order with a stylish Champagne gift box. This product is hand packed onsite by Bottled and Boxed, and is not affiliated with any other brand. Bottled and Boxed is responsible for this product combination/set.